Immerse yourself in the authentic food and culture of Japan on this private 2-day tour which includes a Tsukiji outer market tour, lunch in a local home, and a cooking lesson in a cooking studio. The tour stretches across two days and lasts four hours each day. 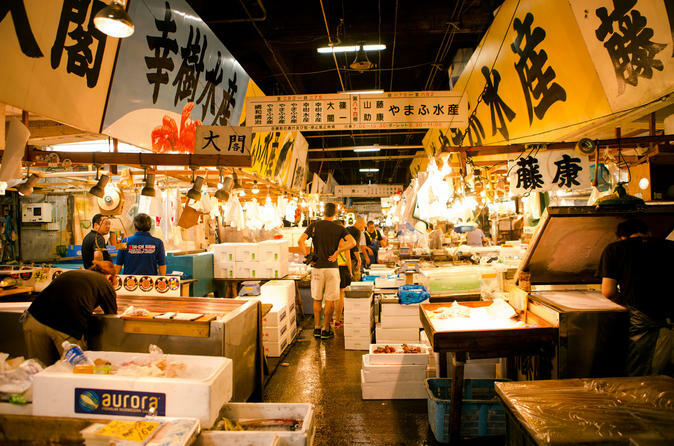 On your first day, explore the bustling Tsukiji market and learn about the incredible variety of seafood that passes through the market before returning to your host's home for an authentic, homemade Japanese lunch. See what it's like inside a Japanese home and share your meal over conversation with your local host. On day two, roll up your sleeves at a Tokyo cooking studio where you will have a hands-on cooking class and learn to prepare classic Japanese dishes. Choose your own cooking menu from options including sushi, Washoku (authentic Japanese home-cooking), bento or Kansai street food. Travel off the eaten path with this authentic culinary tour, led by two different local guides, on this unforgettable two-day experience. Day 1: Meet your private guide at Tsukijishijo station at 10am and embark on a culinary journey through Tsukiji's outer market. Humming with energy and excitement, Tokyo's Tsukiji Market is unlike any other. Get a glimpse into the incredible local seafood trade and watch as a wide variety of seafood exchanges hands at the different stalls. You will also get to discover the rest of the outer market that sells a variety of Japanese goods, from vegetables and fruits to knives and ceramics. Your guide will tell you about her favorite vendors and how to choose the best ones. Her goal is to help you understand the spirit behind Japanese cuisine which is all about enjoying the present moment and season. You may even get to sample a snack like senbei, traditional rice crackers, a local favorite. After exploring the market, take the train one stop with your host and walk five minutes to her home. After relaxing with a refreshing drink, sit down together at your Japanese host's dining table. You will start your authentic home-style Japanese meal with an appetizer like cucumber salad with shrimp or soup with dashi. Next you will enjoy dishes that might include nimono (a traditional, slow-cooked vegetable and meat stew), seasonal fish (slow cooked or grilled) or dashi egg rolls, and ohitashi/pickled seasonal vegetables or eggplant with dengaku miso (a sweet and flavorful handmade miso). End your meal with a hot cup of tea and head back to your hotel for an afternoon nap or stroll through the city. Your host is delighted to offer recommendations for where locals like to hang out and eat. Day 2: Meet your Day 2 host at her cooking studio. After a warm welcome and a refreshing drink, get ready to have some fun cooking an authentic Japanese meal from scratch. Your host is a passionate cook who believes in the simple elegance of balancing Japanese flavors and delights in teaching homemade Japanese dishes to her guests. Keeping with the Washoku (traditional Japanese cuisine) tradition that respects the natural beauty of using seasonal and wild ingredients, your host will use fresh, seasonal ingredients as much as possible in her cooking. Her love of cooking is contagious, and fun! Spend about an hour and a half in the studio learning to cook 3-5 Japanese dishes. Your host teaches you to cook authentic recipes that are easy to master and provides handy tips and easy-to-remember instructions. Once the meal is prepared, you will sit down, chat, and enjoy your culinary creations together over local beer or sake. Get excited to dive into dishes such as chirashi sushi or sushi rolls, miso soup, karaage (Japanese fried chicken), gyoza or a bento box. You will conclude your meal with a sweet dessert and return home with recipes in hand and memories for a lifetime. If you are interested in learning to cook a particular dish, please include it when creating your reservation. Your host will be happy to customize a menu for you.